As you guys all know by now, I change up my base makeup a lot. Partially this is due to my constant desire to try everything out there, but it also depends quite a bit on the condition that my skin is in. The bases that work best for me in warmer weather are starkly different than the ones I turn to during the wintertime. 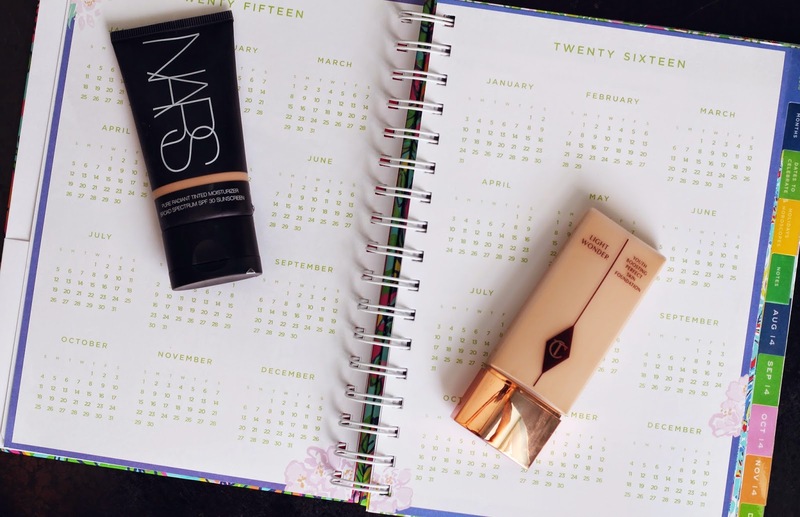 That said, there are two bases I've found that I can safely use all year round (in different shades, obviously), and those are Charlotte Tilbury's Light Wonder and NARS' Radiant Tinted Moisturizer. Both these options manage to give light, natural coverage along with the perfect amount of hydration to glide over dry skin without having to worry about causing excess oil during the more humid months. Out of the two, I find that the option from NARS provides just that extra bit of coverage to cover up any redness or blemishes. I use the shade Alaska for the summer and currently am using the lightest shade Terre-Neuve for my vampire-like skin. The line comes in a large variety of colors which is pretty awesome, and it makes it really easy to find a shade that matches you perfectly during various points of the year. Comparatively, Light Wonder has a much more liquid-y consistency that starts out with fairly low-coverage but can be built up to medium. You might remember that this was my go-to this past fall (in the shade 4 Fair - boy do I miss being tan...) and I recently picked it up in the shade 2 Fair which matches my current skin a heck of a lot better. Similarly to NARS' Tinted Moisturizer, this is really a slap on and go foundation. I apply both using my hands, which I find gives the most natural finish, and I rarely have to worry about unblended lines or having to set them with power. They both just have the magical ability to leave behind good looking skin, all year round!